Canada's Wonderland, Cookie Café, 1988-1989. At the time I'm writing this comment (2014), the car accident and death of 3 friends where we used to work as teenagers happened 24 years ago. Every once in a while I'll remember something, or come across something (like an ad for Wonderland) which reminds me of them. It is now July 2018. My oldest daughter is 16, nearly the same age I was (17) when the accident happened, and I'm teaching her how to drive. Today during her leson she drifted a bit off the road and it reminded me of what happened 28 years ago. I told her about my old friends Shawn and Robert. I don't know if anyone who knew them will ever see this page. Contact me if you do, I would love to talk to you. 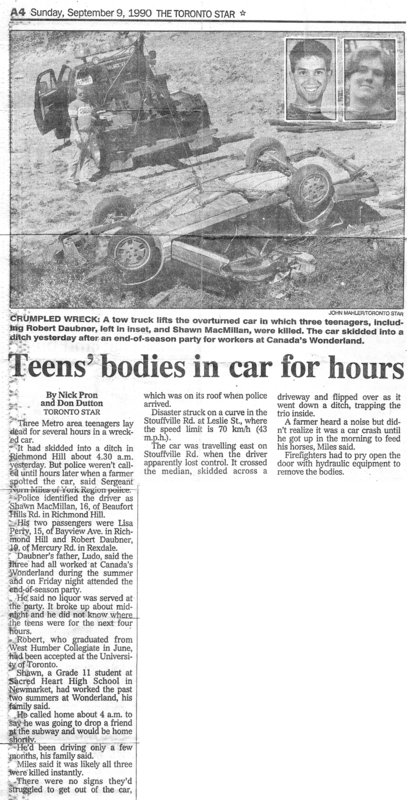 The Toronto Star, Sunday September 9, 1990, page A4.